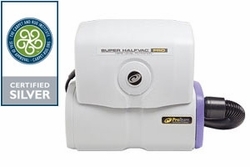 Innovation redefined – the new Super HalfVac Pro. This powerful, versatile vacuum provides superior cleaning power in a lightweight, compact vacuum. Ergonomically designed for commercial cleaners who rely on durability and easy maneuverability. Includes a revolutionary five level filtration system for the ultimate cleaning performance. Includes: Stretch vacuum hose, a 50' extension cord and two Intercept Micro® filters. Warranty: Carries an unmatched 3/3/3/3 - 3 years on parts, labor, motor and molded body parts. Watts: 1050 W Weight: 10.5 lbs. Decibels: 66 dBA Airflow: 106 CFM Static Lift: 97 in. Amps: 8.5 A Capacity: 6 qt. / 6.6 L Four Level Filtration: 1060 sq. in.